If Technology Is Not the Answer, What Is? My very bright grad student, Megan Rolfe, recently forwarded me a link to Kentaro Toyama’s provocative article, “Technology Is Not the Answer,” in the March issue of The Atlantic. I’m intrigued by his experience, and sympathetic to his point that technology serves as an amplifier of underlying values and social structures. In fact, I was trying to make much the same point when I wrote about the use of new information technologies in the social service system in my book, Digital Dead End. Information technology could certainly serve to connect poor and working families to community resources, make the process of applying for benefits more transparent, and ease caseworkers’ cumbersome paperwork to free them up to spend more time with clients. But under the new, hyper-punitive regime of post-1996 public assistance, it largely serves to proliferate sanctions and intensify surveillance. Similarly, the information economy, rather than leveling economic and political economies (as Thomas Friedman et al. might argue), can amplify historic inequalities while adding a bruising shot of new insecurity and rapid change, a phenomenon I call “volatile continuity” in my book. So rather than creating sweeping social change, new technologies often magnify underlying social arrangements. Rather than sweeping away old power relations like a digital Noah’s flood, new ITs act like Hurricane Katrina, following existing socio-economic cleavages with devastating effects for those living in valleys of poverty and inequality. 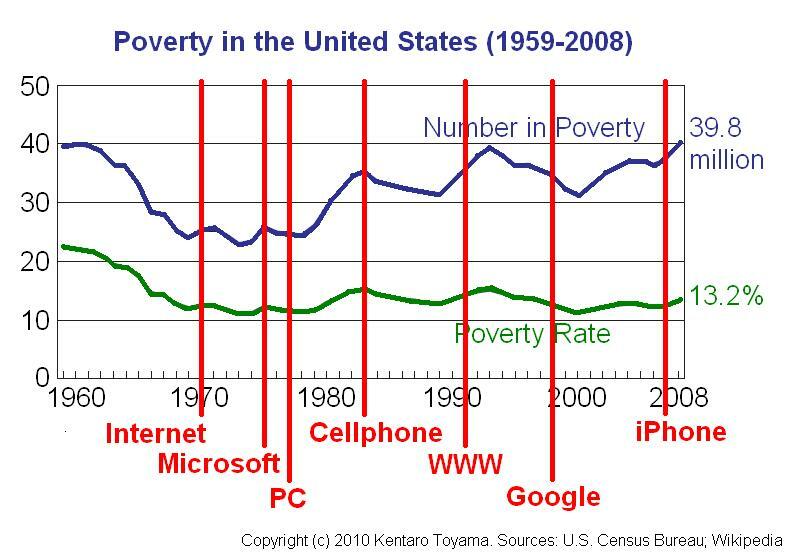 This brings me to the thing I like most about Toyama’s brief piece: a simple chart that traces the rates of poverty in the United States against a time line of major innovations in communications technologies such as the internet, the personal computer, and the world wide web. No big surprises here, but the image is incredibly effective for breaking through some of our more magical thinking about technology and social justice. I start to get frustrated with Toyama’s argument when he starts to talk solutions — for him, the focus should be on (individual) human intent and capacity, on virtue. If what he means is that we in the US need to realign our political and economic practice with our national values of liberty, justice, equality, and democracy, I agree. I think Mark Robert Rank, in his book One Nation, Underprivileged, makes a compelling argument that this kind of realignment is necessary if we are ever to take the epidemic levels of poverty in our country seriously. Explaining that technology is just one thing we put undue faith in, Toyama coins the acronym TIPS — technology, institutions, policies and systems — to describe what he considers the most visible parts of cultural change. The real iceberg, he claims, is the invisible but more significant bulk of “individual and societal intent and capacity.” I got Marxist base/superstructure flashbacks when I read this, but in reverse. As I’ve traveled throughout the northeast on my Spring book tour, audience members have asked again and again for specific solutions to the wide variety of social, economic and political problems Digital Dead End describes. So I respect Toyama’s attempt to look beyond the tools to the problems that underlie high-tech inequity. But solutions to the pressing social justice issues of the information age must be systematic and structural, not just individual and organizational. I’m not sure “virtue” is a good platform for systemic social change. So in the next few weeks, I’ll tell you what I see as the “real iceberg” under the social, political and economic challenges faced by the United States. And I’ll provide some solutions and suggestions for how we go about creating an information age that works for everyone. Previous Previous post: A Sputnik moment?